I probably should have included this image with the Monastic City post, but I reckon it deserved its own little space. Entering the City from the Visitor center side, just before you come to the wooden bridge which crosses the river you will notice a granite stone with a circular hollow in the middle of it. This is what is commonly known as a Bullaun Stone. The true purpose of these stones is still not clear. They can be identified as a stone with one or more circular depressions in it, which would normally fill with water. These tend to date back to the Neolithic period, with many being discovered around early monastic settlements. Sometimes known as ‘Cursing Stones’, or ‘Curing Stones’. Sometimes you would find a number of rounded boulders or pebbles within the Bullaun. It is said that these would be used by turning them whilst praying for or cursing somebody. The fact that they are so commonly found at early Christian sites would lead me to believe that these were very important to the pre-Christian people of Ireland, as with many of our traditions, the Christian church would assimilate many old practises into the new religion. One interesting tale linking Christianity to these stones, relates to St. Aed, whom was Bishop of Kildare in the 6th century. The story goes that when born Aed hit his head on a stone, which caused a hole in the stone. The rainwater which collected in the depression was said to have been a cure for many ailments. That said, considering that these stones may date back to the Bronze age, I would think it far more plausible that they were used for grinding grains, like an early mortar and pedestal. But who knows really? To see more of these images, why not visit my Website or join me on Facebook or Twitter. This entry was posted in Diary of a Ruinhunter, Neolithic, Photography, Religious Sites and tagged Bullaun, Glendalough, Ireland, Nikon, photographer, Photography, St. Kevin, The Deer Stone, Travel Neolithic, Wicklow. Bookmark the permalink. just makes me even more determined to get over to Ireland…. So there are a lot of Bullaun stones there? 30 is a lot to be found in such a small area right? I dont know about you but I find it a bit annoying when explanations are given for objects not understood which claim them to be of religious or ritual purposes. There was more to their lives than just that! I like your thoughts on it being used for grinding grain but its rather a large stone for that… querns were more ‘portable’. Ive always wondered whether it was some kind of ancient board game as the depressions are usually quite shallow and there are usually more than one arent there? But the Deerstone squashes that theory… a single depression and quite deep too by the looks of it. I cant help but feel that just because its found at a religious site doesnt neccessarily mean its a religious object. Absolutely, some are even used in some of the building structures.The early church were notorious for hijacking the old beliefs and customs. Holy wells are a prime example of this. They would even build their churches right on top of sacred sites. Just like the Borg in Star Trek, it was a case of assimilate or die. Damn im gonna start ranting now…….. Even the curse/cure stone has a tinge of Christianity to it. The Bullaun’s come in all shapes and sizes and are not exclusive to Ireland. Some have been found in Scandinavia and France. One theory I failed to mention was that in ancient times they were used to leave offerings for the Gods/Spirits. Sadly I dont think we will ever know the true purpose of these stones, all we can do is speculate. I dont think thats sad… its part of the mystique and allure. We dont have to understand something to enjoy it. Do Bullaun stones boil your blood, or is it something I’m missing? Ah well, I share your frustration, and it’s not just in the past, its going on all around us even now. Yes, they totally cocked up the story of our past for sure, but ain’t nuffin you can do about it, except carry on what you’re doing. I think our ancestors know what you’re doing, and I’m sure they appreciate it, and you never know, one day that might share the truth with you. Wonderful story, and great photos. Does the stone have the healing/cursing properties or did that come from the prayer/curse recited? Some good points, here is how I see it. As with many of these stories, I take them as entertainment as they are sourced from a biased point of view, i.e. the early christian church. The curse/cure stone would have been either one or the other. not both. From my personal studies and experience of such things, the stone is only a tool, it holds no magikal properties, in fact the real magik comes from the intention/belief/faith of the practitioner. Enjoyed this post. Grew up not far from here, but never heard the deer story before. Thanks for sharing. Lovely information and photos, I do so enjoy your posts, Ed, lovely stuff, keep it up. Ah thanks, plenty more planned? He must’ve had a very hard head to create that hole! lol Wonderful history once again Eddie! Terrific pictures! 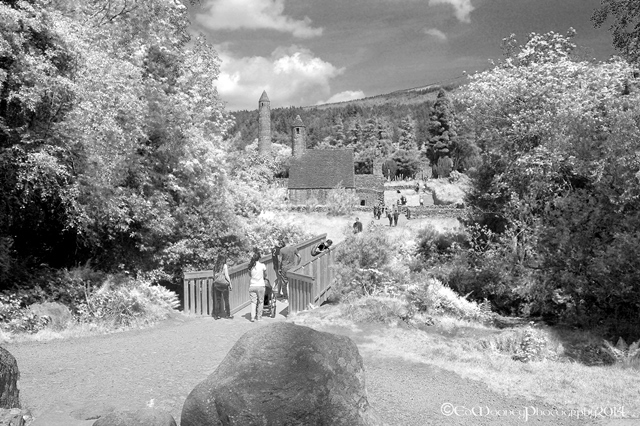 I really must get back to Glendalough again, or as the ancient Irish used to call it, Róimh Iarthair Bheatha, the Rome of the Western World! Great story about the deer stone and St. Kevin. 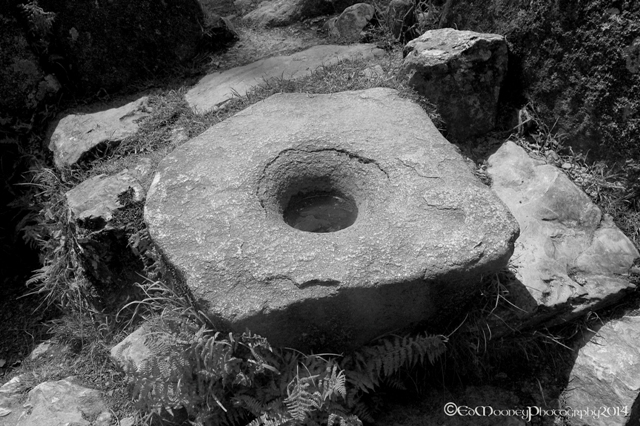 I really like the photo of the stone, round inside the square, with an offering of water. Your history makes the photos so much more meaningful even as wonderful as they are!! Eddie – I enjoyed very much reading your interview. I noticed on that Nikon Magazine article that you can convert your digital camera to infra-red, but it would certainly be wiser as you mentioned, to wait until you get a new one. What you are doing at the moment looks great. Yes its a bit of a process and you still need a special filter for the lense. Will defenity wait until I get a new one. I love the story of the deer. I would expect we can drink deer milk – after all, we eat venison.